The RadMenu Smart Tag allows easy access to frequently needed tasks. You can display the Smart Tag by right clicking on a RadMenu control in the design window, and choosing Show Smart Tag. Choose Data Source lets you bind the menu declaratively by selecting a data source from a drop-down list of all available data source components. If you select the standard Windows Data Source Configuration Wizard appears, where you can create and configure a data source component. Build RadMenu... opens the RadMenu Item Builder, where you can create and configure statically-defined items for your menu. Add RadAjaxManager... adds a RadAjaxManager component to your Web page, and displays the RadAjaxManager Property Builder where you can configure it. Links navigate you directly to RadMenu examples, help, or code library. You can also search the Telerik web site for a given string. Clicking the Edit Templates link brings up a template design surface where you can create or edit the templates your RadMenu uses. Choose Data Source lets you change the declarative menu binding by selecting a data source from a drop-down list of all available data source components. If you select "" the standard Windows Data Source Configuration Wizard appears, where you can create and configure a data source component. If you select "(None)", you remove the existing binding. Configure Data Source... opens the standard Windows Data Source Configuration Wizard, where you can configure the currently bound data source component. Refresh Schemarefreshes the schema for the currently bound data source component. 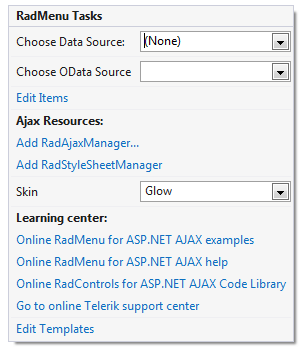 Edit RadMenu Databindings... opens the NavigationItemBinding Collection Editor, where you can specify databindings to map between the fields in the data source and RadMenuItemproperties. Once the Data Source is chosen, you can select each one of the following: DataFieldID,DataFieldParentID,DataTextField,DataValueField and DataNavigationUrlField. For the first two, you need to select the fields in the Data Source that will be used when creating the hierarchy of the RadMenu. The rest will serve data respectively for the Text,Value and NavigateUrl properties of RadMenu Items. Edit Templates brings up the template design surface, where you can create or edit the templates your RadMenu uses.